It was the first scan that I was nervous about…I mean really nervous. So much was riding on this. Statistically, 2 years of clean scans showing No Evidence of Disease (NED) represents a significant milestone and increase in survival. But to be honest, as I’ve stated many times on this blog, I’ve never been one to be too hung up on the statistics. Rather, the 2 year mark was so nerve-wracking because it signified something even bigger…something that cancer so cruelly pauses upon diagnosis…it presented me with the opportunity to finally push play on my life again. Since my diagnosis in June of 2012, I’ve been the cause of so much stress and pain on my family. Of course, they all never complain, but I could easily see the effects. It’s not hard when Miles is continually gripping his chest and trying to beat the ulcer out of his stomach. Or, when I call my grandparents and my grandmother cries each time she says goodbye to me. I hate seeing my loved ones hurting over me. I once asked Miles to just relax and breathe easy, and he told me, “I’ll breathe normally when you’re 2 years NED.” So, I internalized his comment and earmarked that 2 year date. Each night, I’ve prayed and hoped for it to come sooner, as with it, I hoped it would finally bring peace to my family. 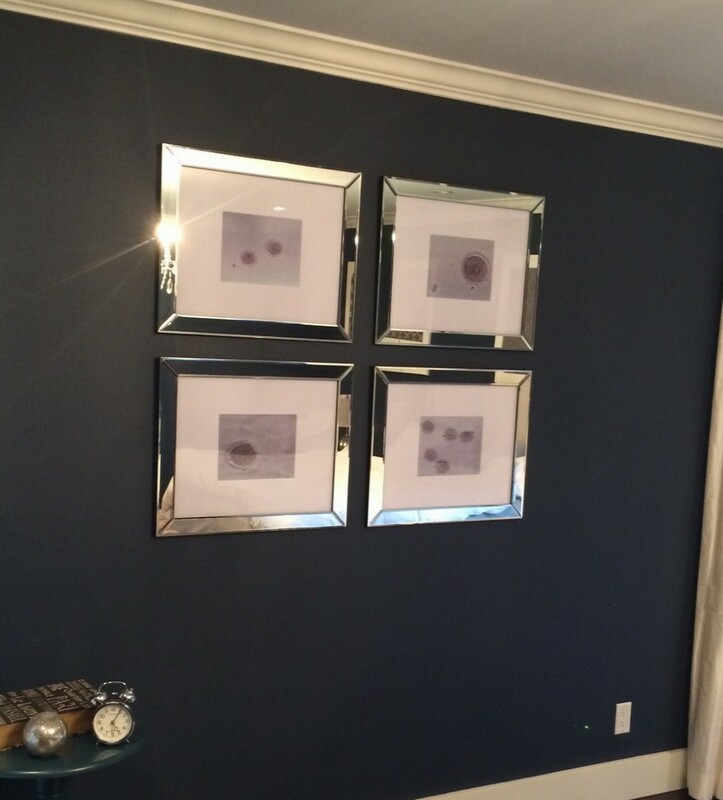 We turned the pictures of our embryos into art, a constant source of motivation. Perhaps what loomed largest though was the opportunity to start a family. 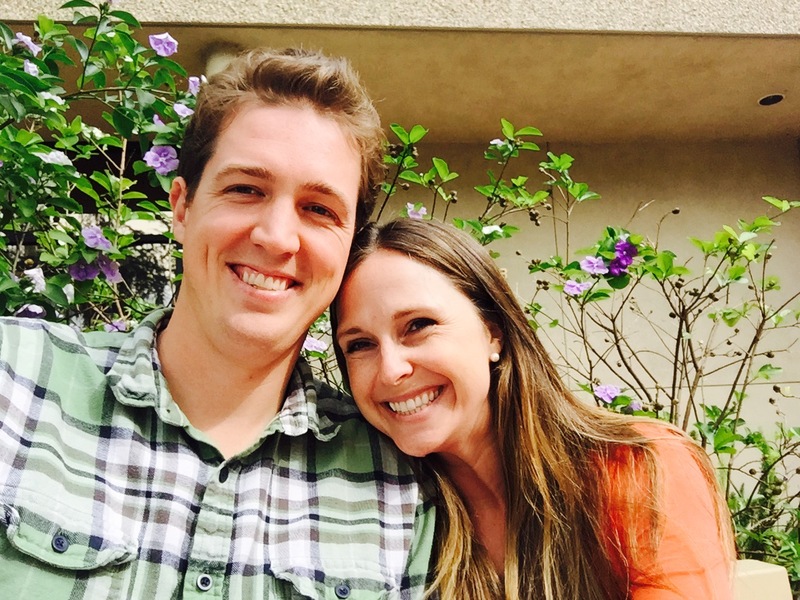 The first step we took after diagnosis was preserving our fertility. Those nine embryos became my motivation. I was no longer just fighting for myself. I was fighting for my future family. Each morning during meditation I would picture and see this family. Hold them, love them, imagine a life with them. It fueled me. It inspired me to fight harder. But, we were instructed not to consider a family until 2 years of clean scans, so that dream, like most things after diagnosis, was put on pause. So a few weeks ago, as we sat there in the doctor’s room waiting for the results of my two-year scan, I could hardly control my emotions. 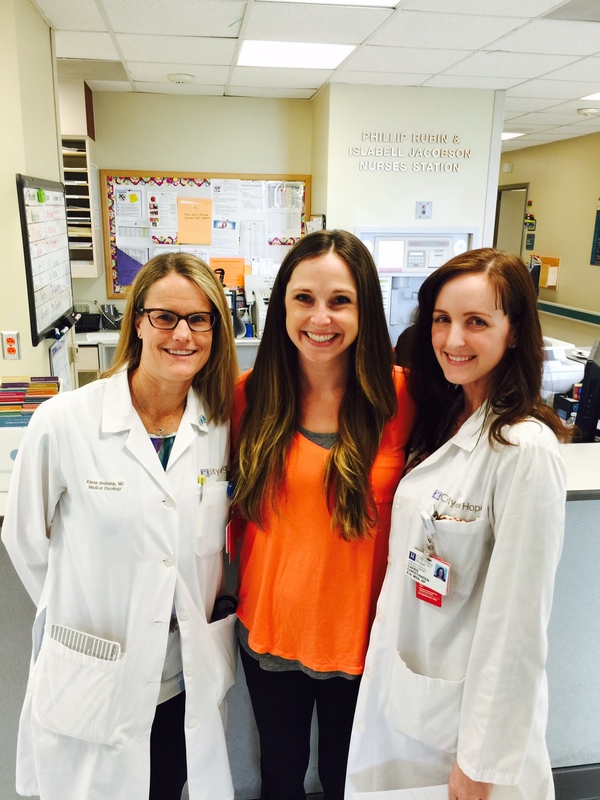 With my amazing care team, Dr. Karen Reckamp, and Carrie Christiansen RN, MSN, C-FNP. I broke down. I sobbed. I fell into Miles and cried. I let years of frustration and fear out of me. He held me and then whispered in my ear, “You’re going to be a Mommy.” And I cried even more, but with the biggest smile on my face. It takes a village to raise a child. It takes Team EmBen to grow a baby! 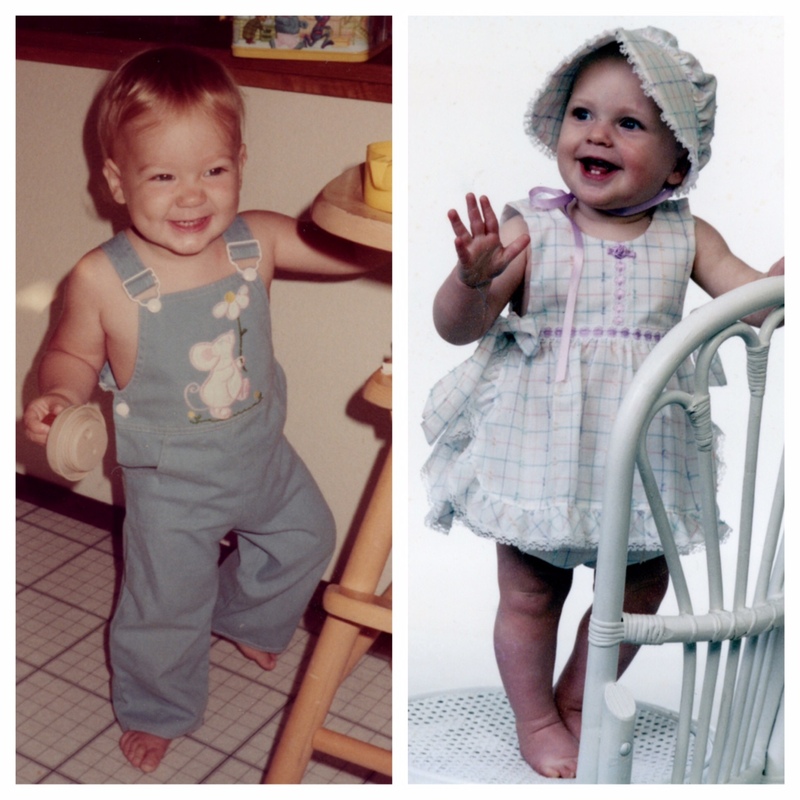 Baby pics from Miles and me at around the same age. I’m so excited to have a little cutie like him! Miles and I are beyond excited to push play again on life, and start our own family. But the reality is, we can’t do it alone: we will need a surrogate. The hormone surges caused by pregnancy have been shown to be linked to recurrence of lung cancer. As such, I have been advised by my doctors to not carry our embryos myself. Since Team EmBen has been so resourceful and supportive in the past, we are reaching out to all of you for help in finding a surrogate. We would love to undergo this process with someone who comes from a trusted source. We understand this is such a large ask of someone, as a pregnancy is a considerable undertaking. However, if you know of anyone who may be interested in providing this immeasurable gift, we would love to hear from them. When are we looking to have our child? Ideally, we are hoping to perform an embryo transfer as soon as possible, preferably this summer. So, yeah, that’s soon. Yes, of course! Money for this process was so thoughtfully donated to us at the time of my diagnosis. We would love for this money to go to someone we know (or someone who knows someone we know! ), rather than an agency. Ideally, surrogates have no major medical issues, have at least one of their own children, had pregnancies and deliveries with no complications, and are physically healthy. What would be expected of me (surrogate)? Essentially, there would be 3 appointments in Los Angeles. Each appointment would be a month apart. You would be able to choose your own OB/GYN at home, and the baby would be born wherever you are. In the meantime, your only job would be to have a healthy pregnancy. If you, or anyone you know, may be interested, please email us at eebennet@gmail.com. Sitting by the fountain at City of Hope, taking a moment to celebrate this wonderful milestone. As ever, thank you all for joining and supporting us on this journey. We are so grateful to our loving Team EmBen supporters! This entry was posted in Inspiration, People Are Amazing and tagged #beatlungcancer, #cleanscans, #onelung, #twoyearsNED by EmBen Taylor. Bookmark the permalink. I have been so busy that I missed this post! I am so thrilled at the thought of the two of you becoming parents. What wonderful, caring and inspiring parents he or she will have! You are an amazing survivor and advocate Emily, and you and Ben have both been such a huge an inspiration to me and so many others whom you so unselfishly share your journey, guidance and shoulders with. I know the two of you will make awesome parents (and I am sure that Michele is just itching for a new grandbaby!). I am so happy for you Emily and Miles. I trust you had a blessed Easter and a fun time with family over this past weekend. PS, you and Miles participated in our lung study looking at quality of life at COH. Breathtaking post. Looking forward to the rest of your beautiful journey. I’m sending you every possible good wish. I hope you’ve gotten some interesting responses! Funny side note: you have the same nurse practitioner as mama Milev! Vlad saw the post and was like – we know her!! I know that the Easter bunny is going to find you the perfect surrogate and deliver the eggs!! Your story continues to inspire, uplift and give hope and happiness to all of us, Emily and Miles. So very thrilled to hear your NED good news and wonderful plans for the future. It is truly a season of celebration for so many reasons! This is so beautiful. Putting the word out to my circles– you never know how you might connect with the right person. I feel certain that you will! Congratulations for this milestone! And such a ray of hope for others. Having watched the Ken Burns documentary on cancer, looks like we are beginning to win the battle with pioneers like you leading the way. Thank you so much for this Emben. You let us experience and appreciate each other so much more this whole time by letting us into your courageous journey. I think Casey makes an excellent name boy or a girl. EmBen and Miles … I am so VERY thrilled for you. First of all, WOO-HOO and congratulations on being NED for two years. I will hold good thoughts that THE PERFECT surrogate will be willing and able to carry your child … and what a lucky child s/he will be to have you two as parents and be part of such a wonderful, loving extended family.